So basically what this person was saying is that they believe that if they get their English writing up to scratch, their speech will quite naturally follow. Now, there’s a good chance that some of you, guys, are thinking the same way, so I consider it my sacred duty to steer you in the right direction and make you realize that it would be the wrong road to go down. NEVER ever put your English writing before your speech, or else you’re running a serious risk of developing terrible English fluency issues that you won’t be able to deal with for years to come! Why your ability to write in English correctly won’t translate into oral fluency! You don’t have to be a genius to realize that human beings learn to speak first, and only then they learn to write. When you start teaching a child how to write, they already have most of the conversational speech patterns imprinted pretty well in their brain and they can speak fairly fluently! They will learn how to write words and put them down on paper, they will learn how to string sentences together, but the most important thing to understand here is that they WON’T EVER WRITE SOMETHING THEY CAN’T SAY OUT LOUD FLUENTLY! Now, what happens when you start learning English as your second language in a typical academic setting? The teacher will make you write down words and sentences that you CAN’T SAY OUT LOUD WITHOUT THINKING. It’s like putting the cart before the horse – you’re trying to force the knowledge into your brain through writing without realizing that the natural way is through your mouth! As a result you will be able to write quite well, but your speech will be constantly lagging behind because you’ll be relying on your writing skills when speaking. You’ll be basically speaking as if you’re writing, you’ll be constructing sentences in your head before speaking them out loud and your speech will be slow, hesitant and unnatural. The symptoms I just described are experienced by millions of foreign English speakers, and what are they doing in order to rectify the situation? They spend even more time writing and learning grammar being under the false impression created by the traditional English teaching industry! I know all this only too well because I was in the same boat – I was focusing on writing and I truly believed that it was going to directly translate into my ability to speak fluently. And how wrong was I! I didn’t realize that writing and speaking are two completely different skillsets! You see – when you write, you have all the time in the world to construct grammatically correct sentences. When you speak, it’s quite the opposite – you don’t have any time at all. You have to say it all out loud without any planning whatsoever, and that’s when all these fluency issues start happening. Just like I said before – it’s completely different when you learn to write being able to speak the language. You have the skill of speaking already acquired! And to help you get the bigger picture, let’s look at the definition of illiterate people and how it proves that speech comes before writing. There’s Millions of Illiterates in the World, But Show Me a Single Person Who Can’t Speak While Being Able to Write! As we all know, there’s still plenty of people in the world who don’t have access to schools and as a result they can’t read or write – it’s called being illiterate, otherwise known as being analphabetic. Now, I think you’ll agree that those people can speak their native language fluently without being able to write, right? But now let’s try to imagine a scenario whereby a person hasn’t learned to speak yet they can write. Is such a scenario even possible? And obviously I’m not talking about deaf people or people having speech impediments. I’m talking about a scenario whereby a healthy person has learned to write while still not being able to speak. Well, I guess you have to agree that some crazy social experiment aside, it’s just not possible! A person will ALWAYS learn to speak first, they will wire their brain with speech patterns so that they can produce them automatically, without any thinking, and only then they will learn how to formulate their thoughts on a piece of paper! Well, guess what? You’re right! Writing is the way languages are taught all over the world! But have you ever thought about that fact that it’s also the reason why most people don’t become fluent in the target language and struggle to speak? Just because something has become the accepted standard, doesn’t make it right, and just because English is typically studied by way of writing and translating, doesn’t mean it’s the most effective way of learning the language! It’s quite the opposite actually – learning English by way of writing and translating is the least effective way of learning it, and the reason why this absurd situation is taking place is quite simple: the students just DON’T KNOW ANY BETTER! English students assume that when they reach the native-like level of writing, their speech will catch up, but more often than not, it’s not the case. The answer to this question is in the question itself. Those relatively few people who’ve achieved decent fluency in English despite having learned to write first have done so DESPITE the wrong learning method. They’ve been working really hard on their speech to turn the tide and suppress the ill effects of the traditional teaching environment which facilitates the “writing mode” syndrome. And the funny thing is that most likely they wouldn’t be able to explain it themselves! They would still attribute their success to the traditional studies thus sending out the wrong message to others who’d be following in their footsteps without realizing that it’s the SPOKEN PRACTICE that has made the other person fluent, not writing. 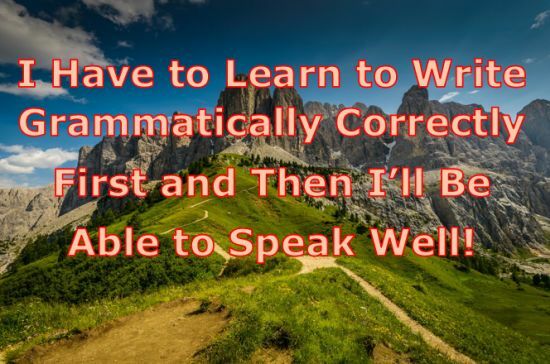 And so the vicious circle goes on and on, and yet another foreigner buys into the myth of learning to write grammatically correctly first hoping that it would somehow make them into a fluent speaker. All I can do is just hope that you’re not going to be that foreigner, and that’s the reason I just wrote this article, my friend!